She enjoyed her morning with her wonderful bridesmaids prepping for the wedding with makeup by Tiffany Stout and hair by Laura Claire. The bridesmaids were in soft blues while the gentlemen were in grays with ties coordinating with the ladies dresses. The Catholic ceremony was held at Mary, Star of the Sea with a intimate group of family and friends. This charming church, built in 1938 is part of La Jolla’s history. It was created with a contemporary Spanish Mission style design and is iconic for the La Jolla community. The couple had a few close family members acting as sponsors; people that the couple respect and admire who have been role models to them as a couple. The sponsors support and contribute to the wedding day. This traditional Catholic ceremony included a cord and veil in their ceremony which the sponsors carried in to the ceremony. The cord symbolizes the unbreakable bond of marriage while the veil represents the two becoming one. The cutest flower girl and ring bearer were also part of the ceremony! As they exited, the guest blew bubbles and waved ribbon wands in celebration. The couple rented golf carts from La Jolla Golf Carts to drive themselves and their bridal party from the ceremony to La Jolla Cove for photos before the reception. This was such a cute and practical idea! The cocktail hour and dinner, held at La Jolla Woman’s Club, was a cozy group of close family and friends who enjoyed food by MIHO and beverages by Bar Works. Cocktail hour included fun sliders, fries, and poke while dinner included a variety of tacos, rice, and jicama salad. There were delicious vegan options included in everything too! Sweet Cheeks curated the delicious assortment of cupcakes and the small cake which the guests savored. Vegan Chocolate with Salted Caramel was the signature cupcake for the bride while Red Velvet with Cream Cheese was the grooms! Every table was numbered in a very unique way – it included a photo of the bride and groom at the age of each table number. It was so fun to see how they looked as children! The styling of the wedding included an elegant color palette of ivories, soft blues, and golds with touches of greenery throughout. Elegant Floral created the beautiful personals and wedding centerpieces with this lovely color palette with hints of grays peeking through. Dancing DJ Productions created such a fun and energetic environment for this celebration who executed a very fun grand exit of the couple as well. The photo booth was provided by Cake Photobooth which the guests enjoyed during the evening. Babsie Ly captured all the magical moments throughout the day! Thank you Babsie for all these wonderful photos. Videography was done by Brett Munoz. We wish Kristina and Eric all the best in their lives together. 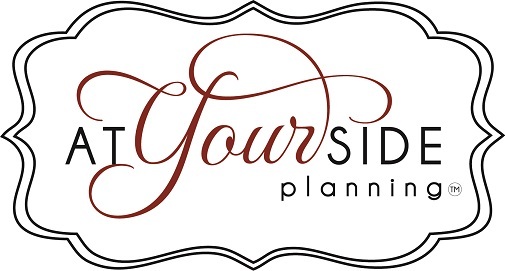 Thank you for allowing At Your Side Planning come on board for your wedding day!